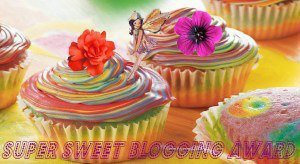 I have been nominated for The Super Sweet Blogging Award by The Day Dreaming, Candy Eating, Red Haired Bookworm! Thank you so much!! Again, a huge thank you to Lindsey!! 1. Cookies or Cake? Both? : Cookies!! Especially chocolate chip. 2.Chocolate or Vanilla? : Chocolate for everything but ice cream. 3.Favorite Sweet Treat? : Chocolate chip cookies!! 4.When Do You Crave Sweet Things The Most? : Nearly all the time, but especially when I’m stressed! 5.Sweet Nick Name? : My grandmother used to call me Sweetie Pie! C. Include the Super Sweet Blogging Award in your blog post. D. Nominate a baker’s dozen (13) other deserving bloggers. Thanks so much again Lindsey for the nomination!!! I’m off to let my nominees know about their nomination!